My 2014 projects in review can be seen on this page: Finished Knits 2014 and there’s a link on it to the project specifics for the patterns and yarns used. I have a tradition of beginning a new project on New Years Eve and this one was no exception. 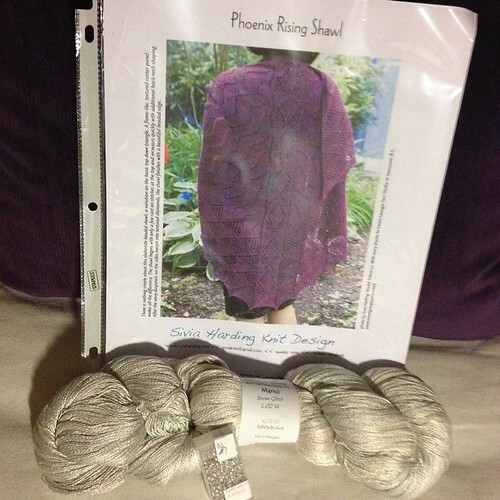 Serendipitously and very appropriately, I had all the materials to start “Phoenix Rising”, a shawl by Sivia Harding Design. I’m a fan of Sivia’s patterns and the name and it’s associated story seem a metaphor for my life in general and how I’d like to see it continue this year. 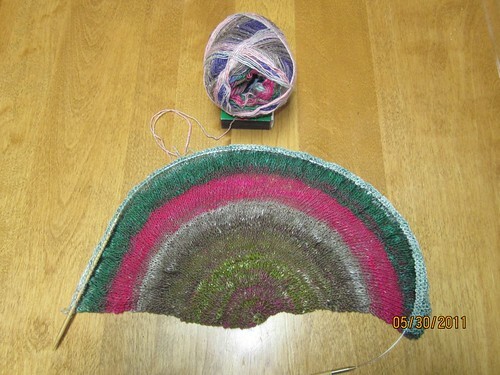 I don’t have a progress photo yet, I’ve been utterly engrossed in the making of it but here is a peak at the yarn – Unique Sheep’s Marici lace, the beads – 8/0 SL crystal AB’s and the pattern. The project page is on my Ravelry here. The “Snow Glint” colourway is exclusive to Earthfaire, one of my favourite yarn store temptations. To start the year off right, my friend Yvonne of Yvieknits Yarns is running a contest over on her blog. Yvie is the talented dyer behind the Mawata silk hankies that were used in one of the classes held this year at Needler’s Retreat 2014, taught by my lovely and talented BFF, Francine Hebert of “Fancy That”, yarn embellishments and jewellery. As it’s the beginning of a new year, I’ll take a moment to invite you to find me on Ravelry as “KarinB” and to join the Pointe Shoes Punk Rock And Purl group there if you wish. I hope to be spending more time there and with publishing my “KB Designs” knitting and crochet patterns. You can find my patterns on Craftsy, Etsy, Ravelry and on my Blogger home “So Many Vices, So Little Time“. I’ll get them here eventually… there really is “so little time”! I sell finished handmade items and some crafting supplies on Etsy as well. If you’re a Social Media type, I can be found with the motley lot that hangs around on Instagram, Twitter, Facebook, Google+, Goodreads, Pinterest and others. The green buttons on the top right hand side of the page will take you to my little corner of those spots. Feel free to leave a comment below about your own other internet spaces and to join me at mine. 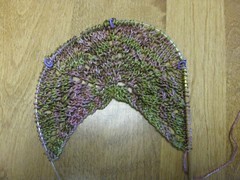 And with that – I’m back to the needles. Will any of you be joining in? Tour de France KAL 2013. This is my friend Natalie of Natalie Servant Designs. Her patterns are so unique and I can’t wait to do my first KAL in forever! The lovely model on the pattern is my BFF Francine of Fancy That. You’ll definitely want one of her exquisite shawl pins for your finished KAL shawl.